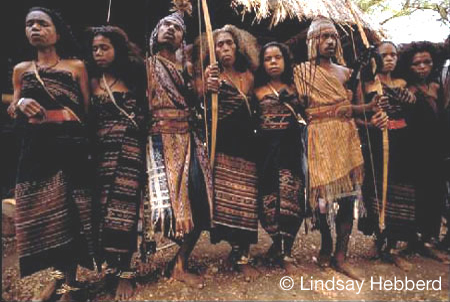 Orang asli, Indonesia's original tribal people, sing haunting melodies and dance in a circle around a moko drum. Dressed in hand-woven ikat cloth gathered by a wide belt of woven bark, a male soloist sings each verse of a traditional song; the refrain is echoed by the other dancers. Alorese women wear ikat sarongs, beaded sashes and bronze ankle bracelets; small woven rattan bags are used like purses. Moko, small bronze ceremonial drums belonging to the ancient Dongson Culture of North Vietnam, were incorporated into the culture of Alor in ancient times.